There's a secret to visiting Yellowstone that's especially true in winter. Walk a few paces on any trail, or just stand still and listen — you'll find solitude in this celebrated, special place. Picture a vast frozen landscape interrupted by copious billows of steam indicating active hydrothermal features — bubbling mud cauldrons, sulfur-scented steam vents, and violent geysers that know no respite even in the deepest cold. 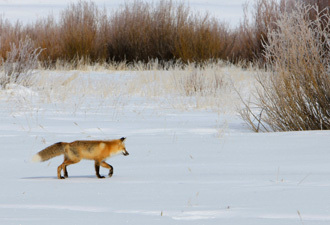 Watch as fox and coyote pace and study unbroken expanses of snow, then leap high to pounce on small prey twitching through tunnels threaded below the surface. From inside the warmth and safety of a car or snowcoach, or from the seat of a snowmobile, encounter bison encrusted with frost, lumbering across the landscape. See trumpeter swans swimming gracefully in waters kept ice-free by hydrothermal features. Listen for wind, and wolves. While most Yellowstone hotels, lodges, and campgrounds are buttoned up in winter, the park stays plenty busy. Hotels, closed briefly between seasons, reopen in December at Mammoth Hot Springs at the north end of the park and at Old Faithful, where the Snow Lodge can be reached by snowmobile or snowcoach. Commercial guides provide snowmobile, snowcoach, and cross-country ski tours of the park. 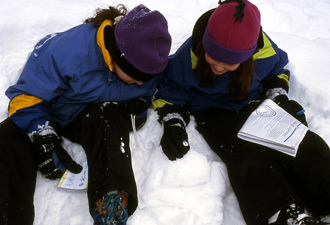 For kids, a free booklet is tailored to winter activities. Park rangers offer talks, evening programs, and advice on current ski trail conditions. Browse the listings of all winter activities and available services, from warming huts to visitor centers. From the historic Roosevelt Arch at Yellowstone's North Entrance in Gardiner, Montana, the park maintains a drivable road during daylight hours south to Mammoth's Upper Terraces, and east through the Lamar Valley to the Northeast Entrance and Cooke City, Montana. You'll have to turn around and come back that same way, though, as a mountain pass outside the park remains closed to cars through winter. Want to know the best way you can enjoy the scenery and help protect wildlife during your visit? Slow down. Unless posted slower, top speed anywhere within the park is 45 mph. Please respect wildlife; many are most vulnerable this time of year. Minimum wildlife distance regulations apply, but the underlying premise is simple — if any wild animal changes its behavior because of your presence, you are too close. Check out the park newspaper for additional tips, intriguing tidbits, and useful information. 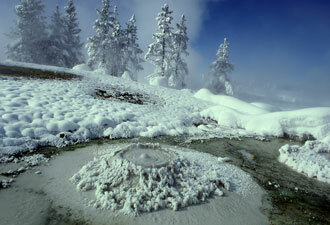 Come experience the cold and quiet of Yellowstone in winter. For some, it's a favorite time of year.